In celebration of the Rio 2016 Olympic Games, Samsung Electronics today unveiled the Galaxy S7 edge Olympic Games Limited Edition in Sao Paulo, Brazil. 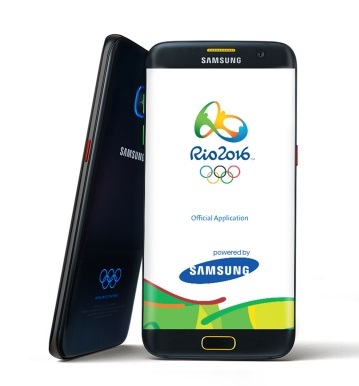 Samsung also announced the Rio 2016 app and on-the ground activations throughout Brazil to mark the official launch of Samsung's global Rio 2016 Olympic Games campaign. In collaboration with the International Olympic Committee (IOC), Samsung will deliver 12,500 Galaxy S7 edge Olympic Games Limited Edition and Gear IconX to all Rio 2016 Olympians. For the first time ever, the Rio 2016-inspired device incorporates an Olympic Games design embedded into the phone itself, featuring a custom colorway pattern including the five official colors of the Olympic Rings. The colors of the Olympic Rings will also be prominent in the phone's user interface in the home and lock screens as well as the message, dial and contact screens and notification bar. Pre-loaded Rio 2016 Olympic Games themed wallpapers will also be available. Athletes will also receive Samsung's newest smartphone accessory, the Gear IconX cord-free earbuds, which offer a new fitness experience with an in-ear heart rate monitor and standalone music player. When paired with smartphones, they can track fitness updates through the S Health app. In addition to providing Galaxy S7 edge Olympic Games Limited Edition for the 2016 U.S. Olympic Team, Samsung will also supply a Paralympic Galaxy S7 edge edition for the 2016 U.S. Paralympic Team. The official application of Rio 2016, "The Rio 2016 App", developed by Samsung in collaboration with the Rio 2016 Organizing Committee, provides athletes, fans and consumers with 24/7 updates on all of the latest Olympic news. The app will be updated in early August to provide the official Olympic Games schedule, venue and event information, results, medal counts, and more real-time updates. Samsung Galaxy phone users can also use the S-translator customized for the Olympic Games. The Rio 2016 Official Application is available for free download through the Samsung Galaxy Apps, Google Play for Android, App Store for iOS, and selected App Store in China as well as the Windows App Store. The "Olympic Athletes' Hub" app, developed by the IOC, will be installed on each Olympian device, where they will find relevant information to make the most of their experience at the Olympic Games Rio 2016. With the app, athletes will be able to reach out directly to the IOC and the IOC Athletes' Commission and can also learn about all the resources and programmes the IOC is making available to athletes.